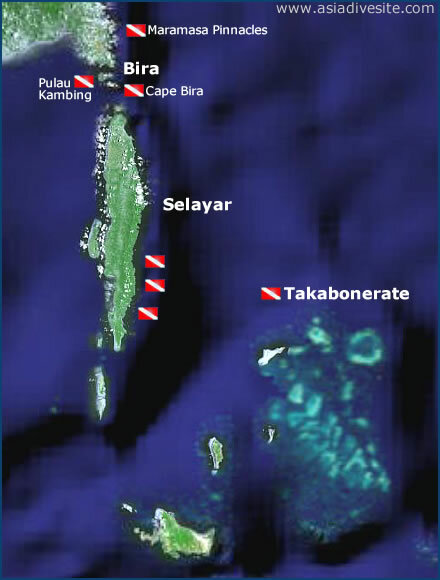 The island of Selayar lies off cape Bira on the southwest tip of Sulawesi. The long island has been slated for tourism development and offers some good exploratory diving both around the island and the cape. A mountain range runs along the eastern side of the island rising to 600 meters and dropping to over 2,500 meters below the surface. This makes for some awesome wall diving in great visibility. There is a stunning 3 kilometer long house reef consisting of pristine coral slopes and walls where drift diving can be done. 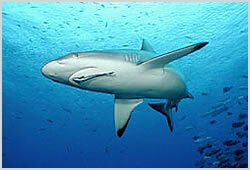 Marine life is astounding with huge shoals of fish and bigger visitors including hammerhead sharks and blacktips. There are a number of impressive dive spots around the peninsular here but currents can be strong and unpredicatable. Sharks are often sighted in the waters around Pulau Kambing where the walls drop to below 60 meters and there are plenty of big schooling fish on the hunt. The Cape has a couple of good spots and some interesting coral formations including a spur at 30 meters that is often surrounded by reef sharks. Maramasa Pinnacles are located to the north of Bira and offer good diving although evidence of dynamite fishing can be seen.